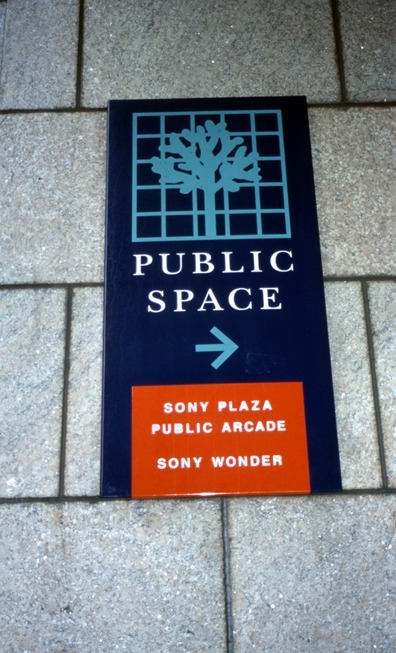 Sony Plaza, NYC is a Privately Owned Public Space (POPS). POPS were created in the late 1960s in a deal made by the city with property developers when bonus office space was given to developers if they either created a new "public" space that they then owned, maintained and controled or they took over and renovated adjacent public spaces. This was common practice at the time when the city was bankrupt. Many small parks and plazas in downtown and midtown NY were created this way and they were the vanguard of todays highly successful BIDs, or Business Improvement Districts.